Eddie is a wounded war veteran, an old man who has lived, in his mind, an uninspired life. His job is fixing rides at a seaside amusement park. On his 83rd birthday, a tragic accident kills him as he tries to save a little girl from a falling cart. He awakes in the afterlife, where he learns that heaven is not a destination. It's a place where your life is explained to you by five people, some of whom you knew, others who may have been strangers. One by one, from childhood to soldier to old age, Eddie's five people revisit their connections to him on earth, illuminating the mysteries of his "meaningless" life, and revealing the haunting secret behind the eternal question: "Why was I here? Eddie is alone. He has no family and no friends. He is bruised both emotionally and physically. In the first chapter of this book, he dies while saving the life of a young girl. Eddie leaves feeling as if his life wasn't anything special and readers follow him into heaven where he meets five people whose lives and death were substantially connected to his own. The reader follows as each person shares a lesson and story. If you haven't read this book, you need to go buy it right now. As much as it sounds like a corny version of Scrooge, it really and truly isn't. Mr. Albom is really great at telling a simple story in the most touching ways. I've often wondered whether people learn the secrets from their time when they die. Will we ever get answers? Well Eddie gets answers and it puts his life in a whole new light. This book is an emotional roller coaster and I found myself wanting laugh and cry usually at the same time. It is a quick read, Mr. Albom's books typically are. For those who don't know, Mitch Albom's book covers are very similar even though they are stand-alone reads. I think the book recognition is stronger than the name recognition. I've found this very interesting because the covers are never anything fancy to look at but they always catch my eye because I instantly recognize them for what they are. Have you read a Mitch Albom novel before? What did you think? Which are your favorite? Some people have very strong reactions against him but I'm not sure why. 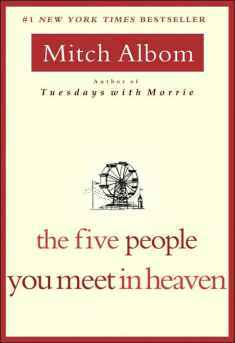 I have only read The 5 People You Meet in Heaven. I loved it! Like you said, it's just a simple story being told but it's so powerful. There was a movie made about this book several years back. I've yet to see the movie and I probably won't. I can't see it having the same impact. Thanks for the great review. This sounds like my kind of book. I haven't read anything by Mitch Albom, but I have been meaning to. Oh you really should. They always really touch me. That sounds like an interesting book.I might just give it a go. I have two giveaways going on at my blog if you're interested. Let me know if you do. I'd like to know what you think. Oh how I love this book! I love Mitch Albom; I read Tuesdays With Morrie in High school; and ever since I've picked up all of his books! I just love his writing and his books always just hit a nerve for me. I taught Tuesdays with Morrie to my class and I'll always remember how enthusiastic they ended up being. It must be a great book if 9th graders who hate reading love it. I can't say that I would even remember that cover after having read the book. I wouldn't remember them either but now that I've read Mitch Albom, I recognize them as his signature. I read this book years ago and loved it. It was so simplistic but so touching and inspirational. It prompted me to read his other books and I've loved those as well. Alborn is a good writer. I heard there was a movie of this book, but as usual, it doesn't touch the book. It is sooo touching! And he manages it without telling a complex story. I don't know why people would have strong reactions against him. I've always loved his books. I've read the 5 People, Tuesdays with Morrie, and For One More Day and I've liked them all. I guessnhe does write a little differently but it appeals to me. He has another one out that I haven't read yet and I'll have to pick it up. I think his books really make you stop and think about life and your own life in particular. I didn't realize people did until I read other reviews and saw an entire website opposing his books. I've loved everything I've read by him. I very much enjoyed this book. The only one of his books that I didn't like was 'Tuesdays with Maury'. 'For One More Day' was my favorite, though. I cried a lot. Oh I loved Tuesdays with Morrie but haven't read For One More Day. I read this book along time ago. I loved it! And Mom's bookshelf is the best place for books. LOL! Ok! You convinced me, I'm going to buy this book. Thanks for sharign this review. Oh that's so great. I hope you love it! I read this book years ago but I remember loving it. It made me cry!